This is going to be a short post as I am packing my van for the trip with Margie and Karen up to San Francisco (Point Bonita) to attend the summer intensive workshops at Golden Gate Fiber Institute. We'll be gone until August 3rd and it should be fun. We're all taking natural dyeing with Darlene Hayes and spinning with Judith MacKenzie McCuin. Friday night, Paul and I watched Huell Howser's show on San Onofre State Beach -- so close to us -- so we decided to take a walk down there to Trestles yesterday. It was amazing the amount of flora and fauna we took in. Here's the famous trestles of Trestles Beach. We watched several Amtrak and Metrolink trains roll by. The ocean is just to the right. It's hard to see, but there is a great blue heron in the middle of this picture. On the walk down to the beach, we saw lots of plants: wild roses, many types of trees, including this blue elder that had pale blue berries and pale yellow flowers. And in amongst the dry brush, this lovely white flower was blooming. Thanks, Huell, for getting us out to do some exploring of a very close natural area. 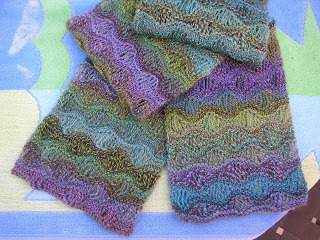 And I finished my Morning Surf Scarf yesterday and washed and blocked it. It's quite lovely and the blueface leicester wool is so soft. And I started a new scarf with some of my handspun. It's extrafine merino wool and bombyx silk (50/50) that I dyed in pale colors of yellow, peach and denim blue. I am using a "tilting block" pattern from the Barbara Walker Second Treasury of Knitting Patterns. This pattern is very easy but looks complicated. An easy project to take along up to Golden Gate Fiber Institute this week. Will report back on our trip up north. Don't you just love Huell Howser? Jerry and I watch all the time to get ideas for day trips and to see things we've done ourselves already. Its a great way to keep up to date with the goings on. J and I watch Huell all the time. We love to discover new places to go and revisit old haunts. Its a great show. I really love your scarf! gorgeous yarn and great pattern... they work so well together. can't wait to hear about your weekend. tell all about it!